The PMV 2020 Tracheostomy & Ventilator Swallowing and Speaking Valve (15mm I.D., 23mm O.D.) 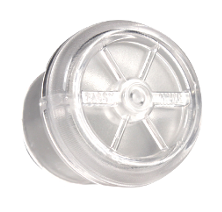 is designed to attach to a metal Jackson Improved tracheostomy tube (sizes 4 or 5 equivalent) through the use of a PMA® 2020-S Adapter. The PMV 2020 is packaged with one PMA® 2020-S Adapter and one Secure-It® that connects the Valve to a tracheostomy tie to help prevent loss. The PMV 2020 Speaking Valve cannot be used in-line with a mechanical ventilator. Latex free. Made in the USA.